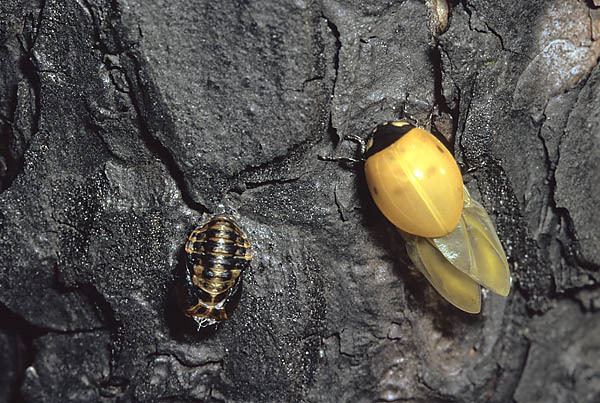 The ladybird female can lay about three hundred oval, yellowish eggs (about a millimetre long) in the course of three months. Her fertility depends clearly on the availability of food. 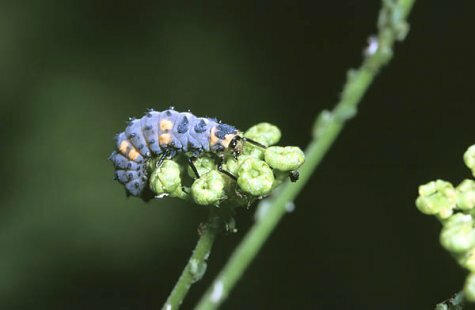 During its development cycle a ladybird will have eaten about a thousand aphids (greenflies) – a hundred adult aphids or three hundred larvae per day. Ladybird moulting on a charred tree trunk after forest fire. The imago annihilates about a hundred aphids a day; when one colony is eliminated they quickly find the next – it is the pretty favourite of our gardeners. If you do not use pesticides in your garden you can bring in ladybirds from elsewhere – they will not fly away as long as there is enough prey. They lay eggs too and so there will be a next generation of aphid fighters in your garden. Leave a heap of leaves in a corner of the garden in autumn, there the ladybirds will survive the winter snugly. In addition to the seven-dot ladybird we can meet other quite common ones: the five-dot and two-dot ladybirds. The bright red colour sends a signal to insect eaters – “we aren’t edible“. Who attacks gets a dose of corrosive, nastily smelling and tasting orange haemolymphatic fluid, and then the ladybirds will certainly be left alone.